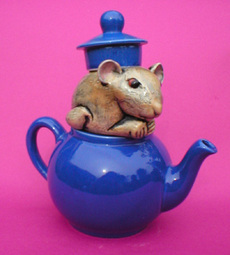 While searching for cups on the net, I ran across Andy Titcomb's hilarious teapots. These on the right are the Toddler Teapots. Aren't they a hoot?? If I had muy ducets I'd prolly become a teapot collector. I just love kitschy stuff like this. They're a little (a lot!) out of my price range - the one I really want is this cutey little dormouse teapot, but £75.00 translates to about $150 I think. Holy cats. And at that price I'd be afraid to use it. The Toddler Teapots are definitely adorable and must haves for tea pots collection. I'd love to have those as well. 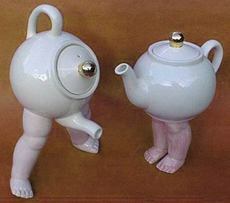 I am cracking up as soon as I saw the toddler teapots it instantly reminded me of my son and daughter. Those are adorable I love to pour my Oolong Tea from one of those. 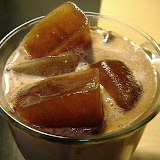 I love the Globo Teapot from Adagio Teas. Definitely not kitsch. I bought a couple of these as gifts two years ago. It's too bad I didn't get one for myself. They're no longer available! Very, very cute and funny!